Anisakiasis is a disease of the stomach and small intestines caused by infection with a parasitic nematode (a type of worm). Most anisakiasis cases are reported in Japan, Western Europe (particularly Scandinavia), and the Pacific coast of Latin America where raw or undercooked seafood is eaten regularly. The symptoms of anisakiasis include sudden, severe stomach pain and sometimes mimics appendicitis, often with nausea, and vomiting. You can get anisakiasis by eating undercooked or inadequately treated (salted, marinated, smoked, or frozen) octopus, squid, and saltwater fish (commonly, salmon). Anisakiasis is not transmitted from person to person. 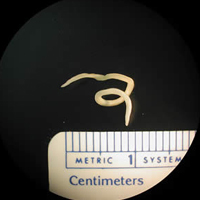 The diagnosis of anisakiasis is usually made by detecting the 2 cm long larvae in the intestines during a medical examination; it can also be found in surgically removed tissue. Most patients improve spontaneously without specific therapy. If necessary, the worm can be removed surgically. Prescribed medications can be effective if surgery is not needed. You do not develop immunity. A second infection is possible. Anisakiasis is not a disease for which physicians are required to report to the Hawaii Department of Health. The risk of contracting Anisakiasis is very low. Thoroughly cook all seafood to at least 140 degrees Fahrenheit or freeze. Freeze fish up to 5 days to kill Anisakiasis.